EdR, a leader in the ownership, development and management of quality collegiate housing, today announced that financing was finalized and the commencement of construction on an on-campus housing community at Texas A&M University-Commerce in Commerce, Texas. 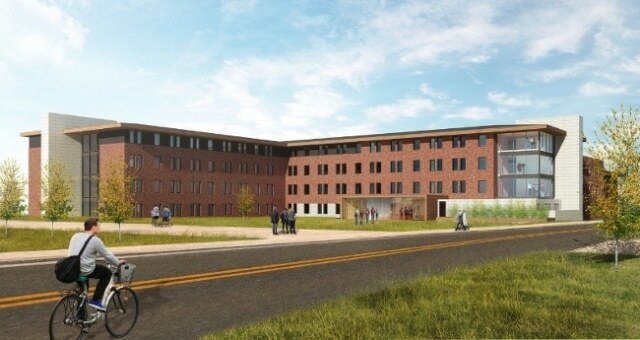 A rendering of the residence hall being built at Texas A&M University-Commerce by EdR. As was previously announced, the $29.9 million third-party development is scheduled for completion in summer 2017. When completed, the university will manage the 490 bed community. "We like to partner with universities who are on a mission to grow their enrollments and transform their campuses," said Tom Trubiana, EdR president. "Texas A&M-Commerce has rapidly expanding enrollment numbers and we are honored to oversee the development and construction of this residence hall that will be a positive force on its campus." The 136,975 square-foot community will be a freshman-only residence hall designed to foster a sense of community for first-year college students. It will also provide private study rooms, several communal areas, laundry facilities (with smartphone app monitoring capabilities), robust internet and Wi-Fi throughout the building. "As a proud alumnus of A&M-Commerce, it gives this ol' Lion tremendous pride to see the continued growth of our beloved campus as well as the continued enhancement of residential housing options being made available to our students," said Phillip Ray, vice chancellor for business affairs for the Texas A&M University system. "Chancellor John Sharp is a visionary when it comes to crafting such innovative Public-Private Partnership collaboration and I am especially grateful for his leadership in bringing this priority project on behalf of the TAMUC campus community to fruition." Alicia Currin, Texas A&M-Commerce's vice president of business development said this new residence hall will enhance the campus in a number of ways. "This residence hall is an example of A&M-Commerce's commitment to strategically add to the residential experience," Currin said. "It will include space intended to foster a sense of community, encourage student development, and beautify the campus." Founded in 1889, Texas A&M University-Commerce is comprised of five colleges awarding degrees in 100 fields of study. Its enrollment has grown nearly 31 percent over the last decade due to its academic programs and convenient location to the Dallas-Fort Worth Metroplex.